Regular readers know that I'm a fan of Bank and Bourbon's annual Bourbon Bash. 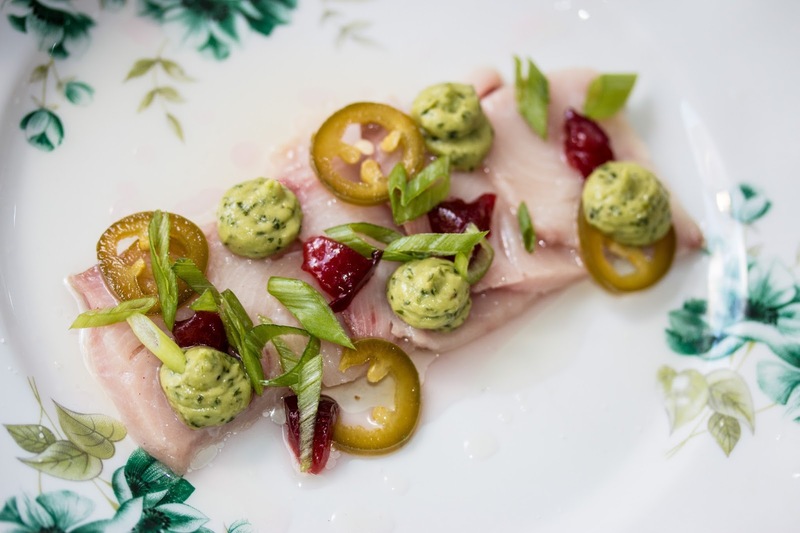 It's an event that every foodie should have marked on their calendars as it's the perfect venue to taste all of South Philly-bred Chef Thomas Harkin's incredibly executed dishes. A stalwart of the Philadelphia Loews from the SoleFood days, he stayed on to "bank" on the hotel's new vision. Chef Harkin and his incredible team epitomize how hotel restaurants have come a long way, whether it's the incredible sourcing of ingredients or the farm-to-table approach. It's no wonder that the 2 bells from Craig LaBan was nearing a third ring for this long-time veteran. 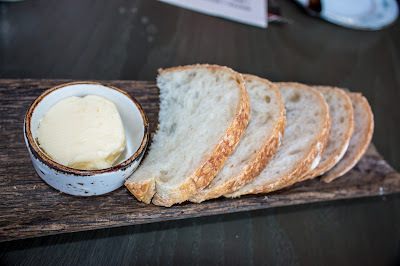 The GF and I were invited to come in to try the new spring menu and as always, meals start off with fresh sourdough and a pat of room temp butter to enjoy. Coupes of champagne were sent over - much appreciated! This was a nice dry sparkler to kick off the night. I love a good crudo and Chef Harkin does his right. The fish was the star, with the wonderful meatiness of the hamachi coming. I appreciated the light accents from the ginger oil and acidity from the pickled plum and jalapeno. The avocado mousse helped to create an even better mouth-feel for each bite. The corn salad was a fresh summer standout and definitely the GF's favorite. 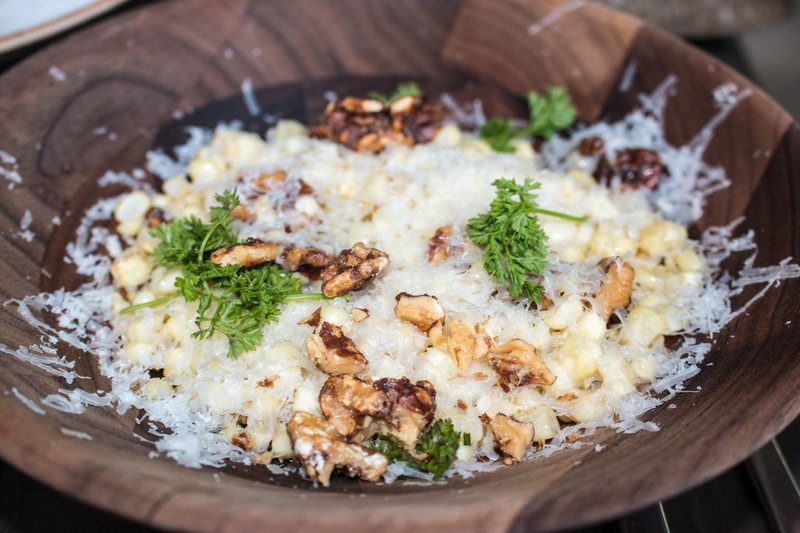 The sweet corn kernels had bite and the texture from the candied walnuts and snowpeas helped to create an interesting melange of flavors. The blanket of salty Parmesan cheese and some bright acidity from the lime helped to bring this dish over the top. 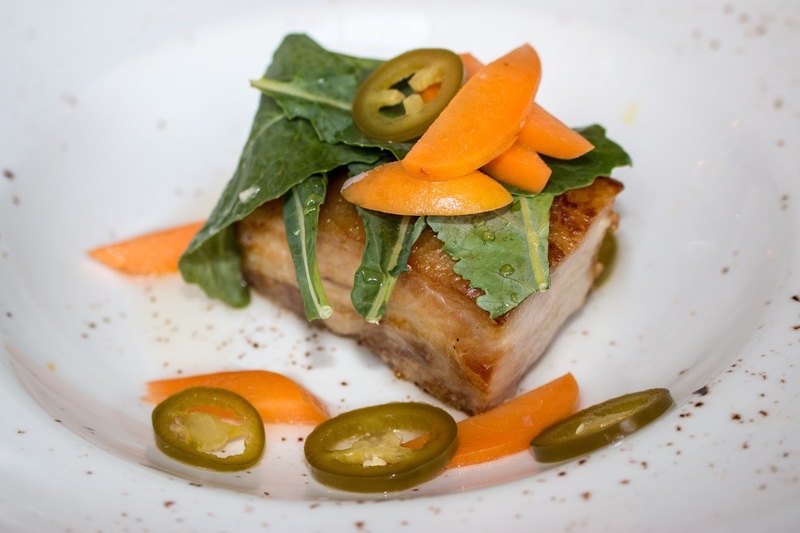 I'm already sold on the fact that Chef Harkin and his crew know how to do pork belly. I still can't forget about their pastrami pork belly from this past Bourbon Bash! So I had to order this starter that ate like an entree. A huge slab of unctuous pork belly was slow-roasted at 250 in juniper and bay leaves and fall-apart tender. The onion soubise had great depth, which provided additional savoriness to each bite. The pickled apricots and jalapeno helped to bring forth some levity and balance to the dish. Spot on! At this point I was aching for the Secret Knock - Bank and Bourbon's signature bourbon cocktail with clarified milk. But I decided to branch out and try the intriguing Trees Knees, which yes, was the bee's knees! For those still afraid of bourbon, it's the perfect starter drink that doesn't go overboard on sweetness. The bourbon-aged maple syrup does bring some subtly sweet lightness to each sip, with bright acidity from the lemon and a bit of smoky kick from the paprika. Easily quaffable and a new favorite. Be sure to check it out during Happy Hour! 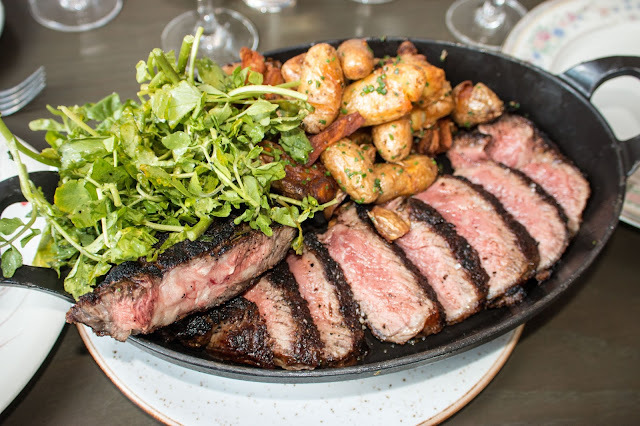 The cowboy ribeye is always killer at Bank and Bourbon. 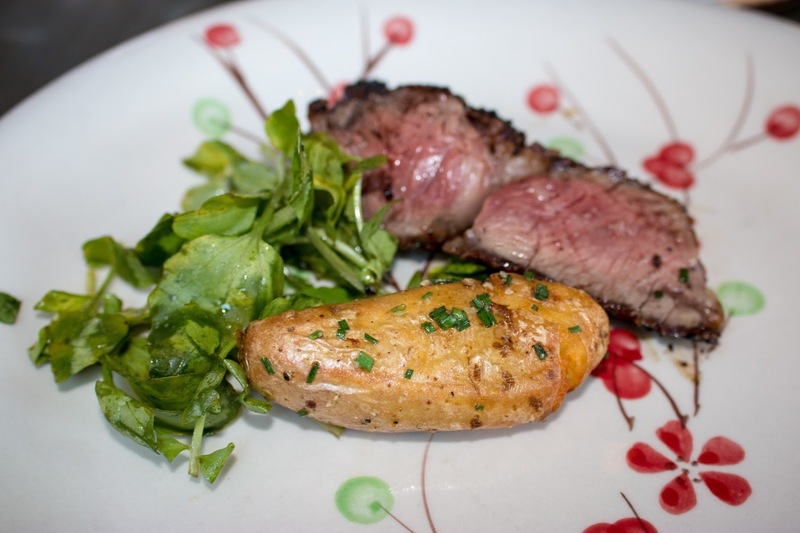 Cooked medium to cater to the GF's tastes, the well-charred beef is so tender you might think it was filet! But don't get me wrong - the enjoyable fattiness of this ribeye could not be denied. The quality of the beef here really shines and it's no surprise that Bank and Bourbon sources approximately $10,000 worth of LaFrieda meats on the reg. For those in the know Pat LaFrieda is easily the king of beef these days. Make sure to check out Bank and Bourbon's burgers which are similarly sourced! But back to the steak! You can't have meat without potatoes right? The crisp fingerlings still had bite within and were well-seasoned. We especially enjoyed the spuds that were extra crispy! I also appreciated the bitter watercress, which helped to provide some balance to the dish. Chef then stopped by and decided to send out all of the new desserts on the recently revamped menu. Kudos to pastry chef Amanda Kaewvichien, who is constantly on-point with her standout desserts! 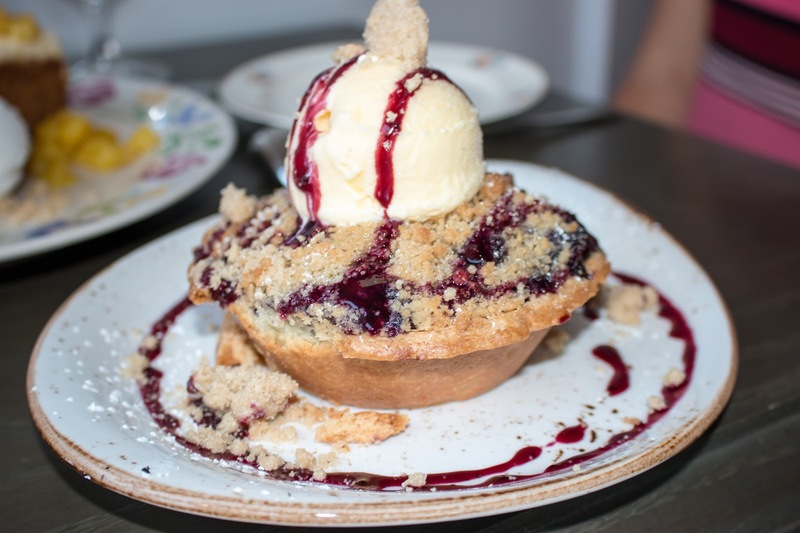 When you see blueberry pie on a menu, you're usually thinking you'll get a nice slice. At Bank and Bourbon, we're talking about a whole individual pie, topped with crumbly streusel and a healthy scoop of vanilla ice cream. The filling within were studded with whole blueberries and I couldn't help but smile with each bite. The moist burnt sugar cake brought forth caramelized flavors that worked well with the cream cheese icing. 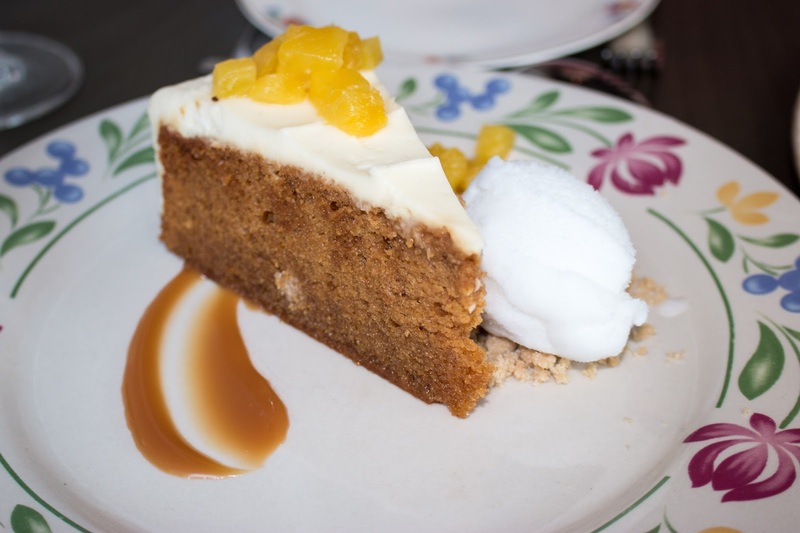 The sweet pineapples and coconut sorbet helped to brighten up the richness of each bite. Ice cream sandwiches are often found at Bank and Bourbon and with good reason. This iteration channeled the city's often enjoyed pretzels. The hearty pretzel cookie shortbread contrasted nicely in texture with the creamy vanilla ice cream. 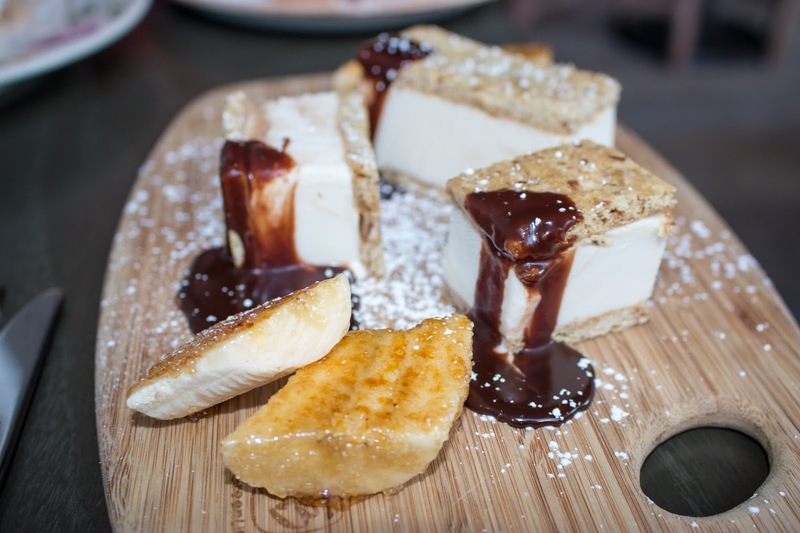 With the bruleed bananas and chocolate fudge, this dish is sure to satisfy your sweet tooth. 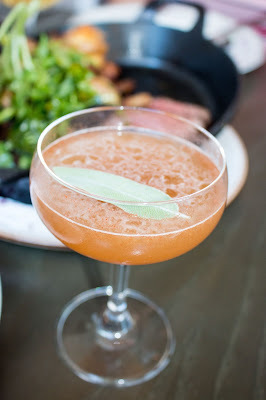 So whether you're looking for a new Happy Hour spot or looking for a proper meal, be sure to give Bank and Bourbon a try. 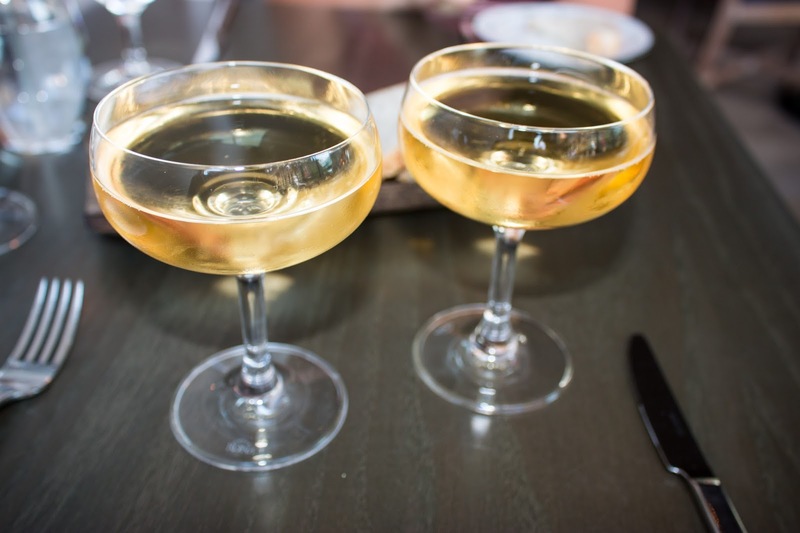 They've got top notch cocktails, incredible desserts, and well-executed dishes that'll have you wondering why it took you so long to give them a try. FTC Disclaimer: Many thanks to Chef Tom Harkins and Jaimi from Loews Philadelphia for hosting us, gratis. Regardless, my opinions are mine alone and, therefore, unbiased.